alaTest has collected and analyzed 449 reviews of Amazon Kindle Fire. The average rating for this product is 3.9/5, compared to an average rating of 4.3/5 for other products in the same category for all reviews. Reviews about the design and size are generally positive. The screen and price are also appreciated. There are some critical comments about the connectivity and GPS navigation. There are mixed opinions on the battery and performance. We analyzed user and expert ratings, product age and more factors. Compared to other products in the same category the Amazon Kindle Fire is awarded an overall alaScore™ of 88/100 = Very good quality. alaTest has collected and analyzed 63 user reviews of Amazon Kindle Fire from Amazon.com. The average user rating for this product is 4.1/5, compared to an average user rating of 4.1/5 for other products in the same category on Amazon.com. People are impressed by the design and performance. The durability and price also get good feedback. There are some mixed comments about the battery. Some have doubts about the camera and reliability. The Kindle Fire HD 8.9 gets a larger screen, faster performance, and still has access to Amazon's deep coffer of books, movies, TV shows, and music. While the entry-level Kindle Fire is a price leader at $159, it doesn't quite measure up to this year's crop of $199 tablets. Inexpensive. Easy to use. Acceptable performance. Promising parental controls on the way. Comes with ads. Outpaced in most ways by slightly more expensive tablets. Editors' note (September 25, 2013): The product reviewed here has been discontinued and replaced with a redesigned Kindle Fire HD . The Kindle Fire (2012) improves on its predecessor in three key ways: faster performance, a better interface with cool new features, and a significant price reduction. Designwise it's the same Fire from 2011 with no HD video support, no camera, no HDMI, no storage expansion, and no volume buttons. The Kindle Fire (2012) takes it up a notch in value, but is tethered to the same design oversights of the original. 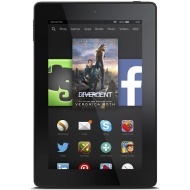 The first easy-to-use, affordable small-screen tablet, the Amazon Kindle Fire is revolutionary. Incredible value for the price. Sharp, bright, hi-res screen. Extremely easy to use. Free cloud storage for Amazon content. Sometimes sluggish. Screen can be very reflective. Limited on-device storage. Editors' note (September 25, 2013): The product reviewed here has been discontinued. Read all about your current Kindle Fire options here . Though it lacks the tech specs found on more-expensive Apple and Android tablets, the $199 Kindle Fire is an outstanding entertainment value that prizes simplicity over techno-wizardry.